If you are looking for supplements for acne these are what have helped me heal mine. Everyone is different when it comes to the causes of acne, but proper nutrition and vitamin support is key in helping heal your skin. That is why I recommend a few different supplements for acne. Keep reading to learn about the acne supplements that may help you heal your skin as well. Ever since I published my post, How I Healed My Acne Naturally, and mentioned that there were some supplements that helped me heal my skin, I have gotten a lot of questions from readers asking what supplements I have used to help heal my acne. So here it is my friends, the post that many of you have been waiting for. 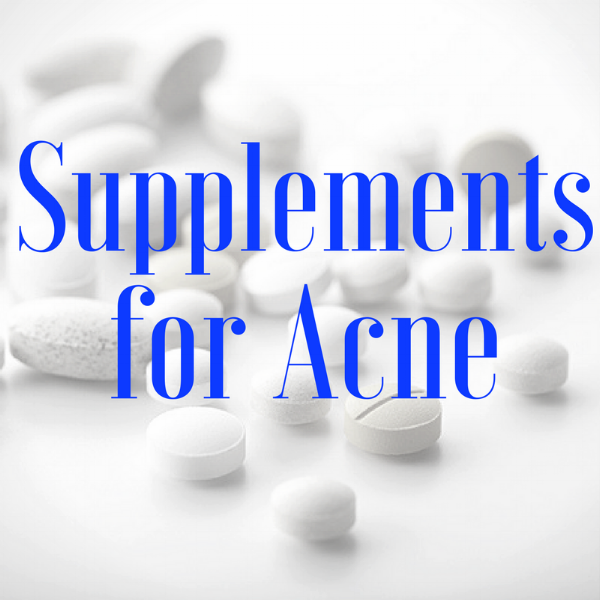 The supplements for acne that I personally use and recommend. If you suffer from acne you know how awful it can be. It may sound vain but having bad skin can impact your entire life. Your self esteem, relationships, work and even fitness. When my skin was at its worst I wouldn’t leave the house without layers of foundation to try and cover up my acne. I was just so embarrassed by my skin. 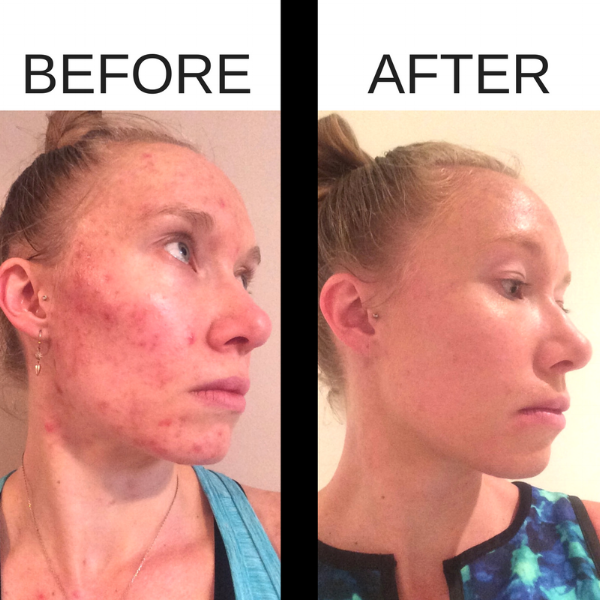 So, a little over a year ago I made a deal with myself: if I couldn’t heal my acne naturally, I was going to go on Accutane. For many, this decision wouldn’t be a big deal, but, you see, using safe and non-toxic skincare products and medication is extremely important to me. I know there are many acne products out there that are extremely effective, but if they aren’t safe, I am just not going to use them. Because the simple facts are that many skincare products contain carcinogens, neurotoxins, endocrine disruptors and other health harming ingredients and I am just not willing to compromise, or potentially compromise, my overall health to heal my acne. To me it’s not worth it. So I was no longer willing to use the products that my dermatologist recommended and wanted to find safe, yet effective, skincare products to use instead. And the same goes for Accutane. It just really wasn’t for me. I know it works extremely well for acne, but the potential side effects and toxicity are not risks that I wanted to take. So I was determined to take a more natural approach to healing my skin. And by switching to safe skincare products and adding certain supplements to my diet I have been able to make a big difference in how my skin looks and greatly reduce my acne. You can see from my Before and After photos just how much my skin has improved over the last year. My skin still isn’t perfect but I am extremely happy with how much my acne has lessened. It took a lot of trial and error on my part to find a skincare regimen that works for me but I am so glad I have gotten to the point where I am finally comfortable in my skin again. I outlined the products I have been using in my previous post, How I Healed My Acne Naturally if you are curious to know what I have used. For most people, there are multiple factors contributing to their acne. However, for pretty much everyone, vitamin and mineral deficiencies are playing a role. This is because the standard North American diet is very nutritionally poor. Not only are the meats, fruits and vegetables that most people are eating lacking in vitamins and minerals due to poor growing and raising practices, but increased processing and chemical additives also decreases the vitamins and minerals in these products even more, and further, most people have difficulty extracting the remaining nutrients from their food (due to numerous reasons which are beyond the scope of this post). I never considered that nutrient deficiencies might be playing a role in my acne until I got iron injections to fix my iron deficiency anemia. My skin suddenly started to improve. With that, a little light went off for me. You see, I had been iron deficient for almost 10 years, basically ever since my chronic diarrhea started and I started malabsorbing the nutrients in my food. I was having a lot of troubles increasing my iron levels naturally (once your levels get below a certain cut off it is almost impossible to correct through diet and supplements alone) so I finally decided to get iron injections through a naturopath. And I am so glad I did. Once I realized that my iron deficiency was contributing to my acne I realized how crucial it was for me to further optimize my vitamin and mineral supplementation and digestive support. So I came up with this collection of supplements for acne which have been really helpful in helping me heal my acne naturally. I am confident that almost everyone could benefit from this collection of vitamins and minerals, but like everything, always check with your doctor and other health professionals before starting any new vitamins or supplements. Before I started taking Trace Minerals I had heard from other bloggers that it had helped heal their acne as well so I know I am not the only one recommending these drops. I add these Trace Minerals to my water first thing in the morning so that I don’t forget. Some people notice a slight taste to these drops, so if it bothers you I simply suggest adding some fresh lemon juice to your water (which is also great for your skin by the way). If you follow me on Instagram you will see me rave about collagen peptides all the time! I put this stuff in everything. Coffee, water, tea, smoothies… even dishes like my Paleo Raspberry Coconut Oatmeal. Collagen and gelatin are extremely important for gut health, skin health and nail health. You need to make sure you are getting properly sourced collagen though. It NEEDS to come from grassfed animals. That is why I only trust Vital Proteins and Perfect Supplements brands of collagen peptides. As well, Perfect Supplements has been kind enough to offer all of you 10% off of your order. All you have to do is enter the code “SIMPLE10” at checkout. How great is that? Most people have no idea that they are vitamin D deficient but the fact is that most people in North America are deficient in this essential fat soluble vitamin. All of the fat soluble vitamins (A, D, E and K) are extremely important for skin health but vitamin D is really difficult to get from any other source besides supplements in most parts of the world. I personally take 5000 IU of vitamin D3 per day. However, one word of caution is to make sure you are getting your vitamin D level checked because it is possible to take too much vitamin D, which can be very dangerous to your health. Liver is an extremely nutritious food and is packed with vitamins and minerals. Unfortunately, actually eating and preparing liver can be a pain. The taste isn’t appealing to many people and taking the time to prepare it into dips and recipes that taste good can be frustrating. Trust me I hear you. That is why I simply take it in capsule form. I personally love the Vital Proteins Liver Capsules the best (I have tried other brands and the capsules tasted horrible!). I take 2 in the morning and 2 in the evening with my meals. Simple as that!